It may be sunny springtime outdoors, but deep within the macabre and twisted souls of ISDP fans there’s always a strangely alluring dark place brimming over with . . . a foul odor. It’s the thirteenth of the month again. The kids are watching some sick crap on CSI: Miami, the spouse is reading The Lovely Bones, and you—you are about to partake in the guilty pleasure of another installment from the Dark Side of olfaction. It was the urban legend of “The Body in the Bed” that led to my first impromptu ISDP research for What the Nose Knows. I found, to my amazement, that dead bodies are routinely found (or hidden) in motel rooms. Although outnumbered here on ISDP by putrid remains discovered in apartment buildings, the motel room scenario remains a classic. found underneath the bed in the motel she had been staying in. The body was discovered after motel guests complained of a bad smell in the room. Sony Millbrook had been renting the room until she disappeared on January 27. Sometime later the motel management cleared her belongings from the room for lack of payment. Before her body was discovered there six and a half weeks later, the room had been rented five times. The motel refused to let her sister look there herself. Nor did Memphis police look under the bed. “In hindsight should an investigator have gone in there and torn the room up? Sure,” said Deputy Chief Joe Scott. Or just sniffed around a bit, Chief . . . The Volunteer state came close to racking up a second incident on April 12, when maintenance workers noticed “two unresponsive people and a foul odor in a rental cabin” in Sevier County. According to the demanding rules of ISDP the incident must have been discovered initially and primarily by smell. Unfortunately, peeking through a window at what turns out to have been a murder-suicide (woman and ex-boyfriend) doesn’t cut the mustard. Thanks for playing and better luck next time. police were called after the apartment building caretaker had received complaints about the odour from other tenants and a plumber working there. Finally, in New Haven, Connecticut in early April a body rolled up in a carpet was found in a trash can behind a house. According to a police, “maintenance workers for the landlord were cleaning up the property and, when one went to the garbage can, noticed that it was extremely heavy and had a foul odor emanating from it.” The body may have been that of a recent resident of the building, which appears to have been run as a half-way house. Pssst . . . if the family’s still busy you can spend a few minutes browsing the Interactive ‘I Smell Dead People’ Map. Hundreds of others already have! In an incident that came to our attention after we posted, the bodies of a couple and their nineteen-year-old daughter were found in an abandoned home in Miami, Florida after neighbors “noticed a foul smell coming from the duplex in the Model City neighborhood.” The family appears to have been squatting in the residence and had not been seen for weeks. I assure you I have nothing against Tennessee. 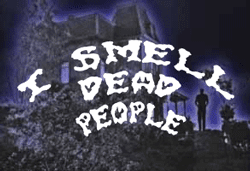 I think it would be great if another state gave Florida a run for its money as the I Smell Dead People capital. (Hmmm . . . that would make a catchy license plate slogan, no?) It's just that we're sticklers for data integrity. And speaking of running up the score, see the update just posted about the Miami family of three.